After the long walks of the previous few days, we had to opt for something significantly shorter today as we both needed to be back in Inverness for late afternoon flights home. 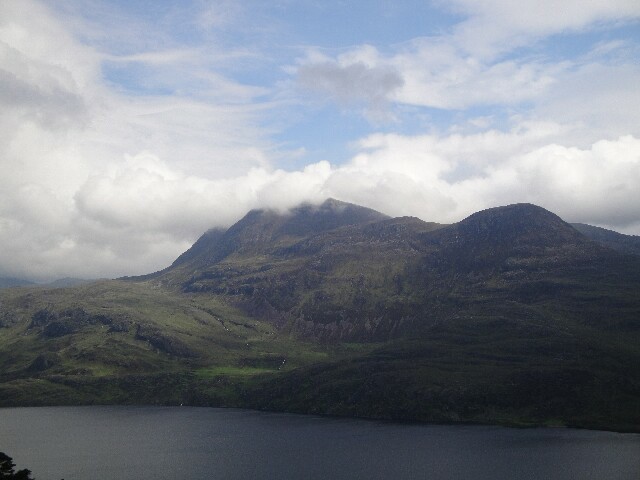 We set off walking from the car park on the shore of Loch Maree at 9:30am in full waterproofs as it was raining lightly. 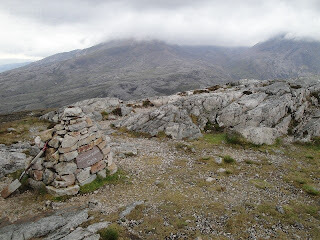 However, the rain soon stopped as we continued to ascend on the Beinn Eighe National Nature Reserve 'Mountain Trail', which was a well built path through the woodland and crags. Every so often, there was a cairn together with a sign indicating what to expect in the next section, e.g. steep path, geology, heather, etc. There were good views over Slioch as we ascended and we reached the high point of the Mountain Trail at the 'Conservation Cairn', on the summit of Leathad Buidhe (Highland Five) shortly before 11am. Soon after we left the path and ascended up steep grass and scree slopes into the cloud to reach the northern summit of Meall a'Ghiuthais. 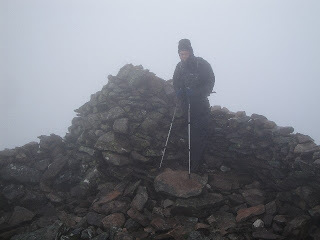 We headed SW along the ridge and reached the true summit of Meall a'Ghiuthais (Corbett) at about 12:15pm. It was very windy here and it was raining heavily so we didn't linger and descended back east to reach the Mountain Trail, which we followed back to the car, arriving at 2pm. We drove back to Inverness and caught our respective flights home. It had been a very good trip, if a bit tiring at times due to the long days, and we had climbed 7 Munros and 3 Corbetts. Post updated today to include link to Leathad Buidhe.